It is not difficult to explain to anyone what is a keyword, most of us use Google everyday and we type words/questions in the search box to find information, answers, services and products. When we try to market a service or a product in search engines it is very important to find keywords that can make a difference to the bottom lines (leads and sales), finding relevant keywords to any website is not a difficult task but understanding the intent behind those keywords and map that intent to the marketing funnel needs some extra efforts. 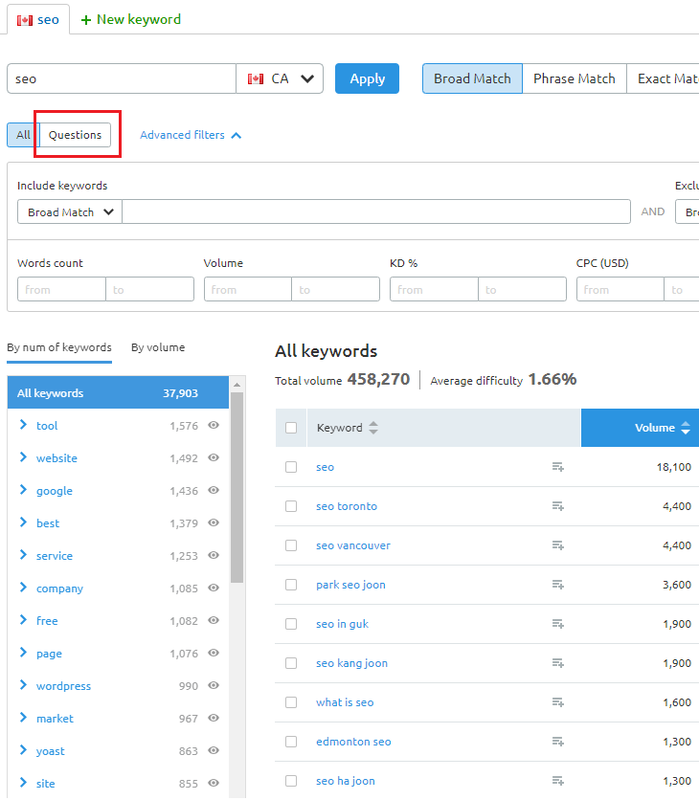 Let us assume you offer SEO services in Toronto and see what keywords we can use for every stage of the funnel. Thankfully it is 2019 and the level of awareness with SEO is really high but there are still many businesses that do not know about it or know a little about it. Articles and blogs are the best form of content to use to target awareness keywords, working with a SEO client that doesn’t have a blog or an article section to create awareness is almost impossible. 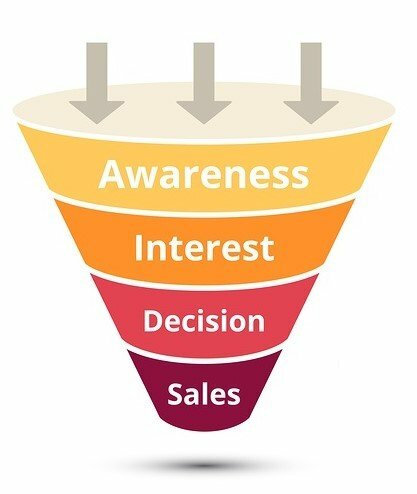 For clients that sell popular products and services (dentists, lawyers etc) awareness might not be required but blogging on a regular basis is still recommended to target top of the funnel keywords (writing interesting educational topics to their users). It is strongly recommended to use marketing automation to nurture top of the funnel traffic and move it down in the marketing funnel. In general marketing or product pages will be used to target those keywords, in some cases blogs or articles could be used also depending on the keyword. A better conversion rate is expected from those keywords comparing to the awareness keywords but they will be more competitive with a limited inventory. The home page, marketing or product pages will be used to target those keywords, blogs and articles do not fit well here. A better conversion rate is expected from those keywords comparing to awareness keywords but they will be more competitive with a limited inventory. 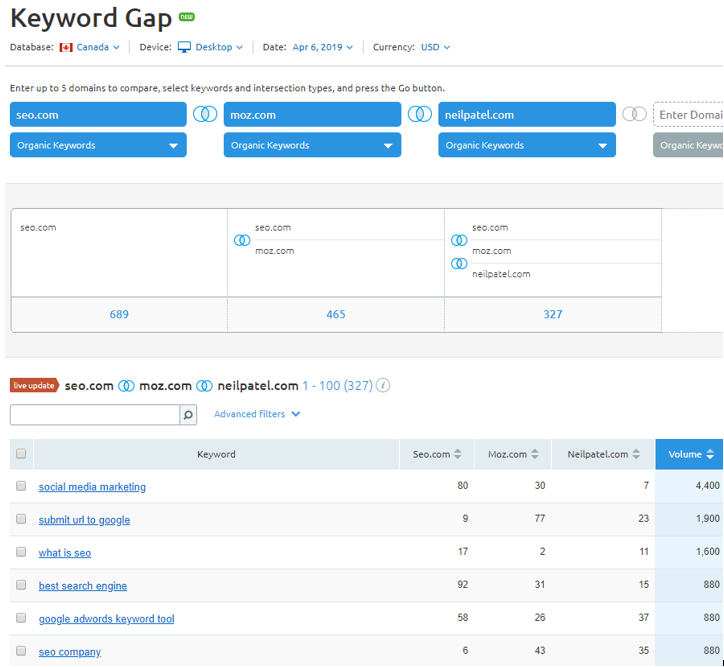 You should be able to generate a list of keywords that can fit all marketing stages (top, middle and bottom of the funnel). Low budget project and low authority domain with difficult keywords: Start the project with easy keywords in the bottom or middle of the funnel and long tail keywords (low search volume relevant keywords with low difficulty and multiple words). Increase the number of inbound links pointing to the content/pages where the target keywords did not achieve the desired ranking (could be done using the website navigation or the blog contextual links), make sure to use a keyword rich anchor text while doing that. If all controllable SEO elements (content, on-page, technical SEO and internal linking) are optimized well but the desired ranking for the keyword is still not achieved then most likely the authority level required to rank for this keyword is not enough for this website/domain, going after a less competitive keyword or a different variation (less competitive) of the same keyword is recommended in this case. Based on performance and priorities a new SEO project must be created to handle the new available findings in each keyword category. Monitoring content performance and reacting quickly to red flags will be key to maintain and improve organic search engine traffic. Thankfully the new version of GSC with some crawling tools have made content monitoring easier, what do we need to monitor? On-page SEO refers to any search engine optimization work you do on your website (mainly on the content and the source code of the page), on-page SEO is not expected to be very technical. At this stage I assume you have completed the keyword research and the content mapping which should enable you to produce a list of URLs with one or two keywords to optimize each URL for. On-page optimization cannot be done in isolation of a marketing plan, content should appeal to users and encourage them to take certain actions, if the element is invisible to users we can possibly optimize it more for search engines. Visible to search engines only, doesn’t have a significant weight on ranking, it is used in many cases by search engines as a snippet in the SERP which gives it a huge value from a click through rate (CTR) prospective. 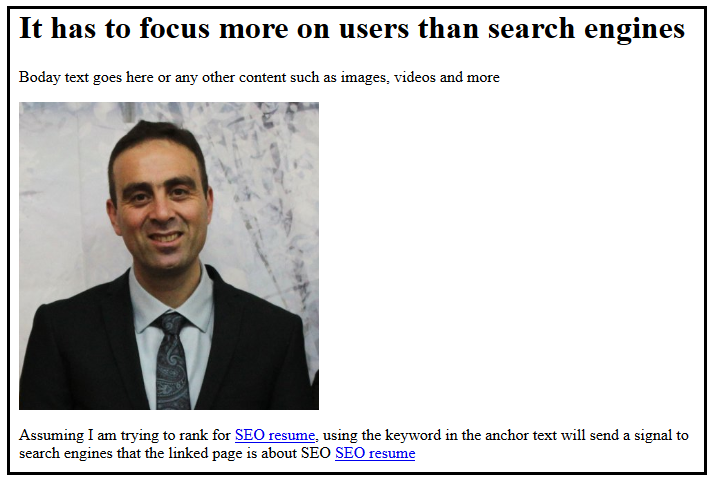 A long career as a SEO expert where I helped more than 1000 clients to gain more exposure on search engines that lead to more traffic and business. I have one keyword mention and a marketing message. 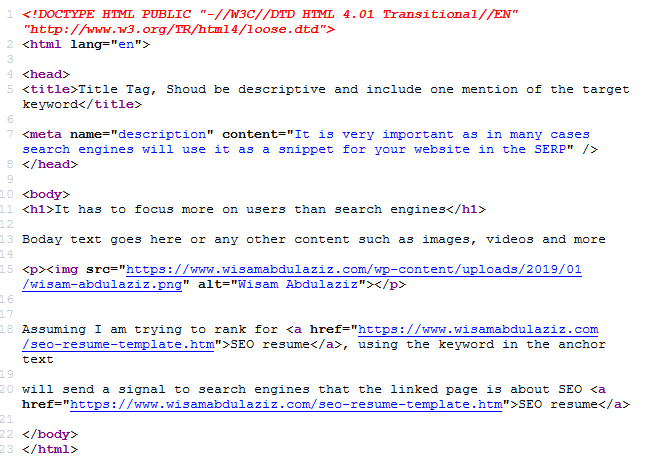 Every page should have a heading, some CMS (content management systems) contain it in H1, H2, or H3 others will not use any Hx tags, regardless of how your heading is coded in the page this section will speak to optimising the first heading of a web page. H1 tags have a premium location on the page, they are always located at the top (above the fold in most cases) and totally visible to users because of that user experience and delivering the right marketing message are more important than keyword mentions as people that read H1 tags are on your website and they are potential leads or customers. 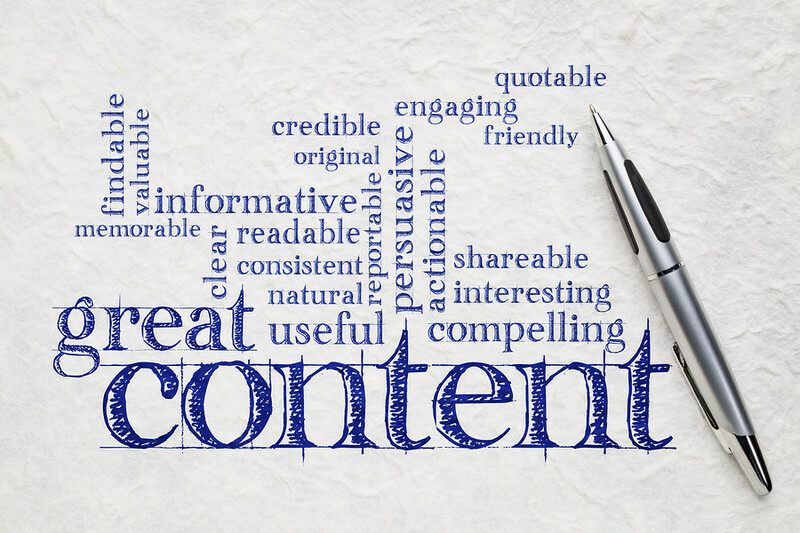 Now start writing your content to better the current winning content, keyword mentions normally come naturally in the body content if not one or two mentions in a user friendly manner will be suffice. The anchor text of the internal links will pass a strong relevancy signal to search engines about the content of the destination page. Picking the right keyword to target is going to be key to achieve results here, if you do not have any chance to rank for a keyword that trigger an answer box organically on the first page (preferably top 5 spots) then find another one as your chances to take that answer box is close to zero, do not listen to those who say it is a schema play and ranking doesn’t matter, in more than 90% of the cases schema has nothing to do with answer box. 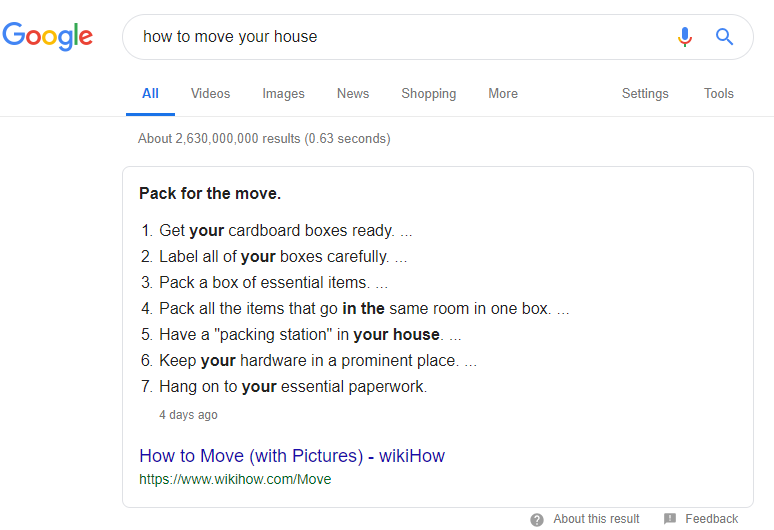 Optimize the title tag and H1 to include keywords that normally trigger the answer box with a list (Example: most popular, things to do, best, types of, steps, facts). What is a winning content? This term is taken form the Google’ quality raters guidelines where they ask their human raters to evaluate the website expertise in the topic, authority and trustworthiness. It is easy to conclude that achieving a good E-A-T score is impossible without creating good content. Please note that E-A-T is not a ranking factor but historically Google always starts a process using humans then build an algorithm to replicate it, a good example for that is their Penguin update that was launched in 2012, they started sending manual actions using human reviewers before making that process machine driven using Penguin Update. Before creating any page you need to decide the purpose of that page, finding one or two target keywords is a good start, keywords are questions asked by users to the search engines, search engines main interest is putting the best answer at the top (that is how they keep users happy and coming back to use them again). If your content is not the best or among the best that can answer user’s question then you are doomed for failure eventually, even if it is working fine now it will not in the next algorithm update. How much text to do you need to answer the user’s question, long text format or short text format? Do you need media content like videos, audios, images, infographics and APPs? Add new images and be sure to optimize those images with alt tags and other image optimization tactics. Do you need to include case studies and data? Do you need to optimize for enhanced SERPs where possible? Why winning content is a tail wind?